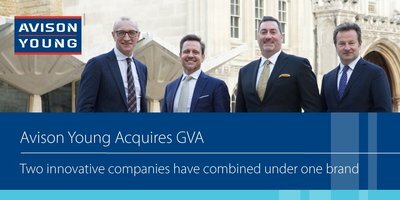 Mark E. Rose, Chairman and CEO of Avison Young, the world’s fastest-growing, private and Principal-owned, global commercial real estate services firm, announced today that it has closed the acquisition of U.K.-based GVA, one of the U.K.'s leading and most diverse real estate advisory businesses. 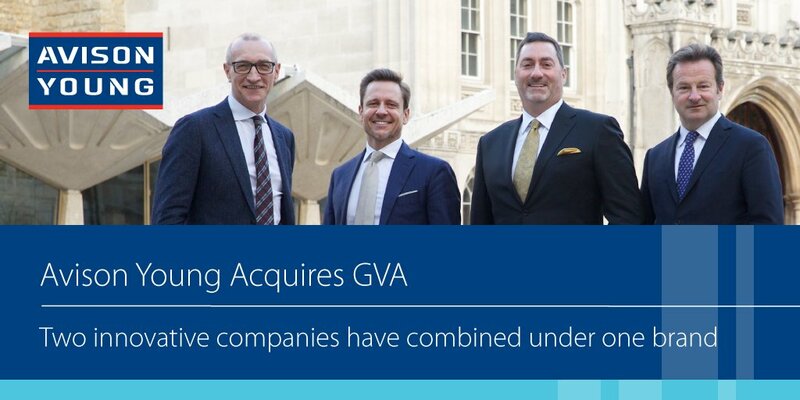 Avison Young completes acquisition of U.K.-based GVA; two companies combine under Avison Young name and brand. L to R: Gerry Hughes, Principal and Managing Director, U.K. and Managing Director, Global Consultancy, Avison Young and Mark Rose, Chairman and CEO, Avison Young. The acquisition establishes Avison Young as the only privately held, Principal-led, global, full-service commercial real estate services firm. 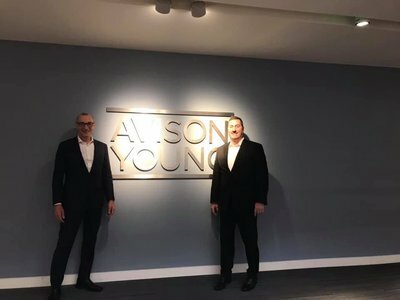 The combination also establishes Avison Young among the top five commercial real estate advisory businesses in the U.K.
Avison Young completes acquisition of U.K.-based GVA; the two companies will combine under the Avison Young name and brand, expand to 5,000 professionals in 120 offices in 20 countries. 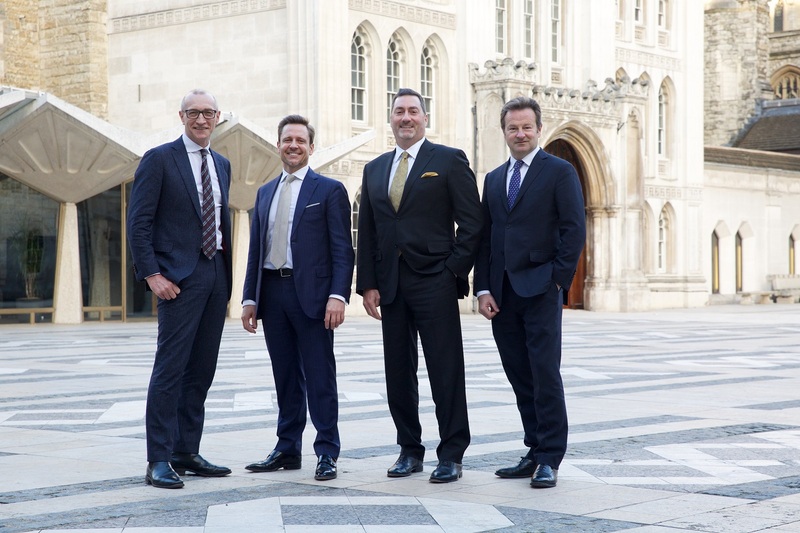 L to R: Gerry Hughes, Principal and Managing Director, U.K. and Managing Director, Global Consultancy, Avison Young; Jason Sibthorpe, Principal and President, U.K., Avison Young; Mark Rose, Chair and CEO, Avison Young; Andy Mottram, Principal and Managing Director, Europe, Avison Young. GVA Chair Andy Mottram becomes Principal and Managing Director, Europe. • United Arab Emirates (Dubai). Mark E. Rose, Chairman and CEO of Avison Young. “This acquisition represents another milestone in our global expansion strategy, and the combination will better position Avison Young to serve our clients across the world,” comments Rose. 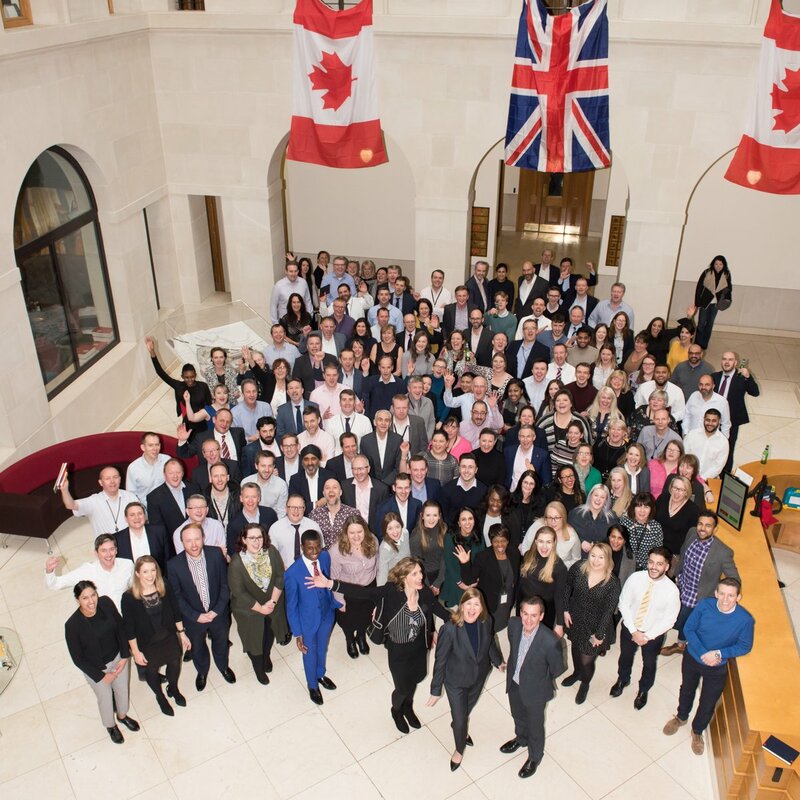 Members of Avison Young and GVA celebrate the completion of Avison Young’s acquisition of U.K.-based GVA. The two companies will combine under the Avison Young name and brand, expand to 5,000 professionals in 120 offices in 20 countries. Gerry Hughes, Principal and Managing Director, U.K. and Managing Director, Global Consultancy, Avison Young (11th from left); Jason Sibthorpe, Principal and President, U.K., Avison Young (front centre); Mark Rose, Chair and CEO, Avison Young (11th from right); Andy Mottram, Principal and Managing Director, Europe, Avison Young (back row centre right). As a result of the merger, Avison Young increases its revenue to 25 times its 2008 level to approximately C$1 billion. Terrific day in Birmingham, U.K. on February 1, as Avison Young & GVA colleagues celebrated the successful merger of the 2 companies! Avison Young completed its acquisition of GVA on Feb. 1, now comprises 5000 people in 120 offices in 20 countries. The acquisition includes GVA Worldwide Ltd. – an international organization of licensed affiliate commercial real estate advisory companies with offices in 20 countries. GVA has 1,500 employees in 15 offices in the U.K., Ireland and Poland alone, and is a founding member and majority shareholder of GVA Worldwide. Avison Young acquires Front Street Commercial Real Estate Group, January 24, 2019, expands presence in North Florida. “Overnight, the ambitious growth strategy that I set out for our business three years ago has been achieved, and we can now serve our clients as a global full-service business, with an enviably strong consultancy and transactional offer,” states Hughes. “Since Avison Young entered the U.K. in 2014, we have had the intent and ambition to build a market-leading real estate advisory business by leveraging our unique Principal-owned business model,” adds Sibthorpe. In connection with the transaction, Avison Young has optimized its capital structure through a recapitalization. The acquisition and the refinancing have been funded through a combination of cash on hand, committed financing from Credit Suisse, CIBC and BofA Merrill Lynch, and additional common equity, including participation by Caisse de dépôt et placement du Québec (CDPQ). Avison Young has ample capital to invest further in its global growth strategy. Today's announcement follows Avison Young’s announcement on July 16, 2018 that CDPQ, one of Canada's leading institutional fund managers, had made a C$250-million preferred equity investment to accelerate Avison Young's strategic growth plan. On October 10, 2018, Avison Young opened its first office in Asia, in Seoul, South Korea, with 63 members joining from Mate Plus Advisors Co. Ltd.
Headquartered in Toronto, Canada, Avison Young is a collaborative, global firm owned and operated by its Principals. Founded in 1978, with legacies dating back more than 200 years, the company comprises approximately 5,000 real estate professionals in 120 offices in 20 countries. The firm’s experts provide value-added, client-centric investment sales, leasing, advisory, management and financing services to clients across the office, retail, industrial, multifamily and hospitality sectors.